Hello. Back in 1996, I bought a CZ Kadet .22 LR conversion for use on a Pre-B CZ-75. If memory serves, it came with a couple of 10-shot magazines. Though I understand it is not always the case, the Kadet unit slid right onto my CZ-75 frame with no problems at all. The magazine locked into place properly when inserted into the magazine well and everything appeared fine. The CZ Kadet magazine seems to be a magazine-within-a-magazine set up. 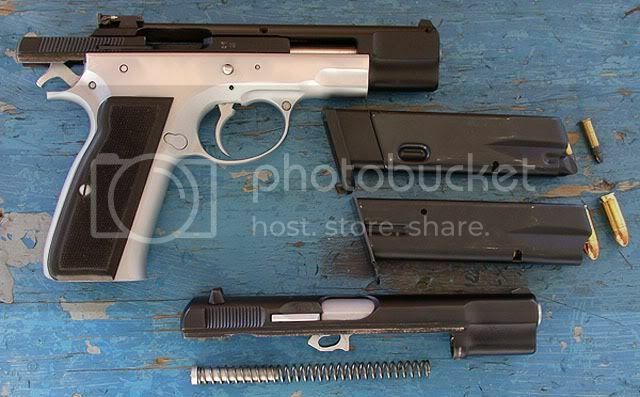 The exterior is about the same dimensions as the 9mm magazine, but the "interior magazine" holds ten .22 LR cartridges. These magazines are not inexpensive in the $35 to $40 price range, but they are well-made and in my admittedly limited experience, work reliably. The Kadet "upper" has a fixed barrel unlike some other .22 conversion kits. The rear portion of the slide moves ala S&W's Model 41, which means that the rear sight does not move. Like the front sight, it remains stationary over the fixed barrel. 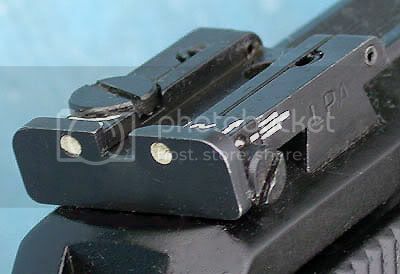 Though not absolutely mandatory, a nice characteristic of this slide setup is that the adjustable rear sight holds its adjustments; once set, it doesn't move. In my opinion, the rear sight is quite satisfactory on this conversion unit and has held zero since it was set years ago. I have owned one of these in my life and have shot only two others so my "experience" with them is based only on a statistically invalid number of units. That said, not one was free of the ocassional failure to fire when first purchased back around 1996. It seems that this was a "teething problem" with the Kadet, but one that was quickly remedied by the company and is no longer a concern today. I contacted CZ-USA concerning this problem and was sent the "chisel-point firing pin" (free) and installed it into my unit after removing the round-nose firing pin. (It is my understanding that for several years now, the chisel-point is the Kadet's standard firing pin.) Changing the firing pins solved the problem for me and the other two Kadet owners I had seen. Here you can see the chisel-point firing pin. It is easy to install and is held in place with a firing pin retaining plate like the 1911, Hi Powers and Pre-B CZ-75 pistols. I've been using this one for well over 10 years now with no issues. Since changing firing pins, failures-to-fire have become pretty limited but still occur now and again. It has not happened with other than "bargain" ammunition, a small price to pay in my view for an easy-to-install conversion unit that actually groups considerably better than I initially expected and consistently tighter than the 1911-style .22 conversion "Kimber Platinum" (Ciener-manufactured) I shoot now and then and is also MUCH easier to disassemble for routine cleaning. My individual CZ Kadet feeds every single type of .22 LR round I have tried in it and works flawlessly with standard velocity ammunition. With "high-speed" or "hyper-velocity" loads, it will sometimes fail to complete eject the fired hull. I am told that this can be easily corrected by filing a very slight angle on the ejector. I have not done this as I use this one only for paper and have pretty much opted to stay with a particular standard velocity load that the gun just "likes". In this time of ammunition shortages, it seemed that CZ owners might be interested in the Kadet conversion unit. (It does not require the Form 4473 as it is not considered a firearm. The Kadet complete pistol is simply the conversion unit with a frame definitely is a firearm and the attendant federal rules apply. The conversion unit can be delivered to your door with no federal "paperwork". At this point I will simply say that the Kadet "shoots". Mine has grouped nicely with more expensive match-grade ammo right on down to the bargain "bulk" loads. Every gun is a law unto itself, but mine shoots nothing, not Lapua, Eley or Federal match any better than Remington's 38-gr. HP designated "Sub-Sonic". Certain of the match loads shoot as well but not one groups better than the Sub-Sonic. While this certainly doesn't mean that the same has to be the case with other Kadets, it might be worth remembering as a possible pet load with today's ammo prices should you opt to get a Kadet pistol or conversion unit. 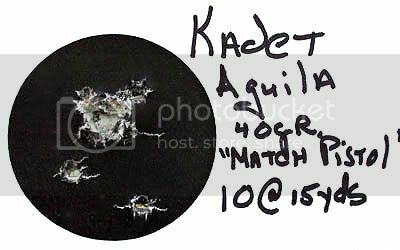 I recently tried another (relatively) inexpensive load in my Kadet unit: Aguila 40-gr. "Match Pistol". It has less felt-recoil than the Sub-Sonic but functions fine and groups very, very nicely as well. Each group consists of 10-shots fired slow-fire from a standing position and using a two-hand hold. Distance is only 10 yards. POA was the center of the black bullseye. At this distance, POA matches POI for the Aguila load as well as the Remington Sub-Sonic for which the Kadet is actually sighted in. The flyers did not occur on the first shot; they were my fault. Neither this conversion nor any I've heard of suffer from "First Round Flyer Syndrome", ie: the first hand-chambered round not having the same POI as subsequent ones. Seeing that the gun will reliably work with this Aguila load and group satisfactorily, I intend to get more of it as I can. At 15 yards, this 10-shot group was fired the same way as those at 10 yards. Other than the two low hits (my fault), the group is impacting just above POA, the center of the bullseye. At the same distance, the Sub-Sonics do strike just below the POA and as usual, group very nicely in this particular Kadet. At 25 yards, the Sub-Sonics are dead-bang "on" for me from the CZ Kadet. The flyer is my fault and I knew it when I threw it. 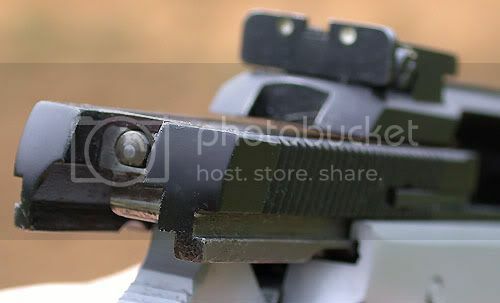 The slide locks back after firing the last shot. On this Kadet, this has not been an issue with any rimfire ammunition that I've ever fired in it. I use mine as a "fun gun" and one to review and reburn such things as sight picture and trigger control back into my brain. 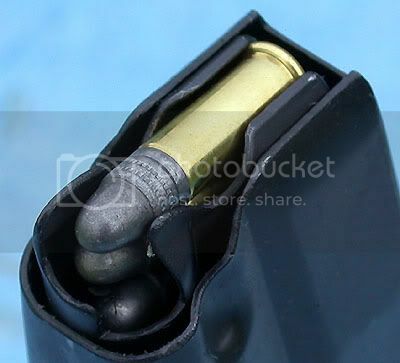 The .22's miniscule recoil allows one to really focus on basics in my opinion and at the same time not be "spoilt" with the superb trigger-pulls common to match-grade rimfire handguns such as S&W's excellent Model 41 or the older Hi-Standard competition guns. (Please understand that were I in formal competition with a rimfire pistol, it would be with a competition-grade target pistol. I am not. Most of my shooting is with service style handguns and I think that using the not-bad-but-not-match trigger pull on my CZ-75 has its own advantages. I can slap on the "9mm upper" and still experiece the very same trigger pull. I do not believe that the little .22 rimfire offers enough recoil to be really meaningful as a round for "practical" defensive-style shooting where recoil-recovery for the quick-but-accurate repeat shot is practiced. Speaking only for myself, I still think that any basic practice is worthwhile and to me, this is both fun and less-costly! One might shoot a hundred rounds of rimfire and then fewer centerfire in these times when ammunition can be pretty scarce! The frame on this CZ-75 was hard-chromed decades ago and this particular pistol has fired lots more rimfire ammunition than 9mm. The Kadet will hold up to lots of shooting in my experience. PS: This review was requested quite a while ago and I apologize for the long response time. Various issues really slowed up my being able to "get with the program" but I am trying my best to complete all promised reviews, etc ASAP and in the order received. That is an excellent review. I am very interested in the kadet conversion. Do you know if it will slide onto the compact frame? I own a PCR compact and love it, but I am also in search of an OD green CZ75 for my collection. 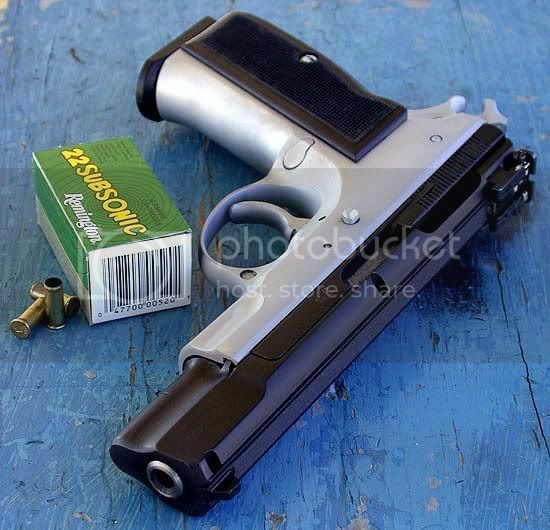 If the kadet conversion will work with the compact frame I will buy that before the OD CZ75. Thanks for the awesome reviews and please keep them coming. "I am a Free Man, regardless of what set of 'rules' surround me. When I find them tolerable, I tolerate them. When I find them obnoxious, I ignore them. I remain free, because I know and understand that I alone bear full responsibility for everything I do, or chose not to do." Hello. I'm not sure if it will fit the compact or not. You might check with the folks at CZ USA. Great article! I really enjoyed reading it. Thanks for posting. I'm a Moderator over there and it's a great bunch of folks! Hello. Since the original post was written a while back, I've continued to use the Kadet conversion on a fairly regular basis with today being the latest session. The pistol is in about the same form as when I did the original post. The Kadet conversion is on the same CZ-75 Pre-B frame as before and still using the same parts as before. I've not kept records on this one but expect it has probably digested another 2000 rounds since the original post. Today I fired 150 shots of Remington 38-gr. 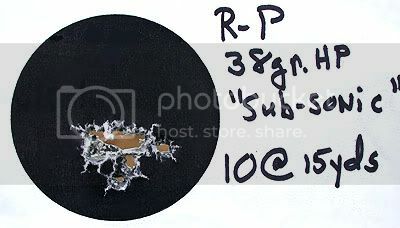 "Subsonic" hollow point ammunition. The Kadet has always shot that load both accurately and reliably. This session was no exception. 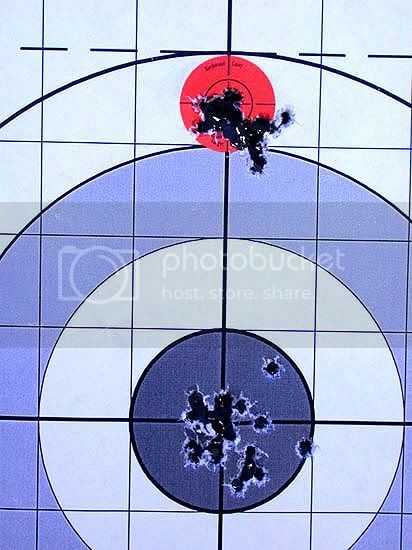 I did some one-hand shooting but primarily focused on trigger-control, sight-picture and follow-through today. I have found the CZ Kadet to remain both reliable and the thing simply has not broken any parts nor does the recoil spring seem unduly light. The slide consistently continues to lock rearward after the last shot is fired and the LPA adjustable rear sight has held its zero just fine. Because the sights remain stationary during the firing cycle, there is reduced chance of them not holding zero. These simply have not required readjusting ... other than when changing (some, not all) between ammunition brands. I consider this one well worth the money spent to buy it. Thanks for a great report. Now, if I only had an extra grand lying around, I'd be in touch with Buds andele pronto. I love my .22 CZ 452 rifles and I suspect their pistols are equally good. Hello. I took my Pre-B CZ-75 w/Kadet upper back out to the range today, but also brought the pistol's original 9mm slide assembly and magazine. 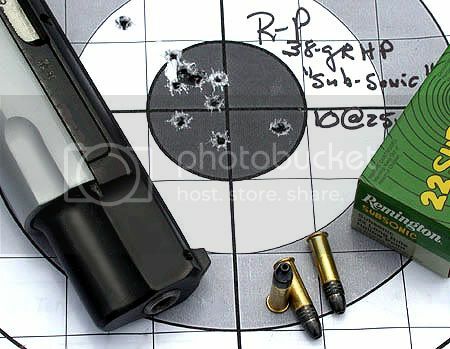 After shooting the compartatively inexpensive .22's for a while, I fired a 20-shot group (two magazines-full) at 15 yards. I then replaced the Kadet and .22 magazine with the original 9mm components an fired a group of twnety shots using Swiss-made 124-gr. FMJ with "DAG" on the headstamp. The CZ Kadet may not be a match-grade pistol for serious pistol competitors but I'm not a match-grade shot, either. I strongly suspect that with its fixed barrel, given ammunition that this particular unit "likes", its mechanical accuracy would suffice for 99.99% of us. 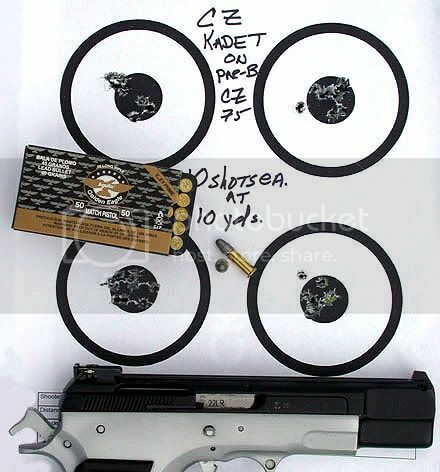 Besides the obvious economy in shooting rimfires, I get practice with the same trigger-pull present if shooting the pistol in its original 9mm configuration. 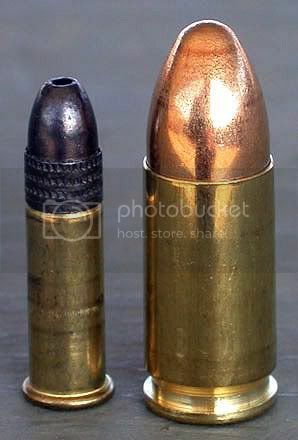 Both the 38-gr. 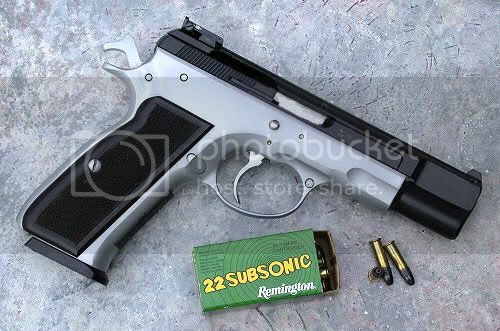 Remington Subsonic .22 lr and the 124-gr. DAG-marked FMJ ammunition worked just fine. FWIW, the 9mm load has proven accurate in two of my Hi Powers, two Glocks and another CZ-75 besides this one. It is boxer-primed in case reloading might be of interest. I had a hankering to shoot this Pre-B, which I did, but the bulk of my shooting was with the .22 lr conversion unit today.